A 38 North exclusive with analysis by Joseph S. Bermudez, Jr.
ROK President Park Geun-hye and the Ministry of National Defense have strongly suggested that North Korea will soon conduct a fifth nuclear test, based on what has been reported as a significant up-tic in activity at the Punggye-ri nuclear test site in the run-up to the Party Congress in May. Recent commercial satellite imagery shows very limited activity at the site and key areas are clear of snow and being maintained. While there is little evidence of that a test is imminent, the possibility cannot be ruled out since the North has demonstrated the ability to conduct detonations on short notice by slow rolling preparations, masking significant indicators from satellite view. 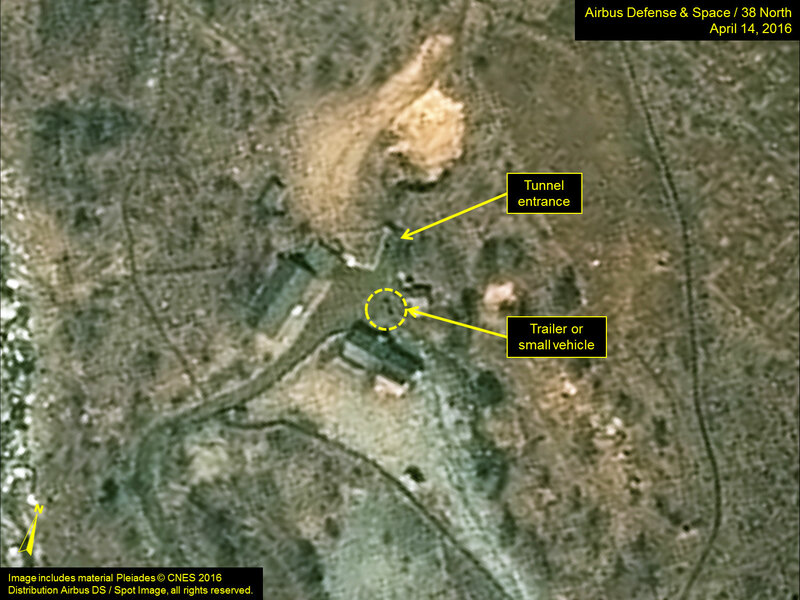 Imagery from April 14 shows limited activity at the North Portal, the location of all of North Korea’s previous tests except the 2006 detonation. One small object (approximately 1.5 m wide x 2.5 m long), which is likely a trailer or small passenger vehicle, is present outside the tunnel entrance, whereas there were two similar sized objects present three days earlier. Figure 1. Trailers or vehicles seen near the North Portal tunnel entrance. 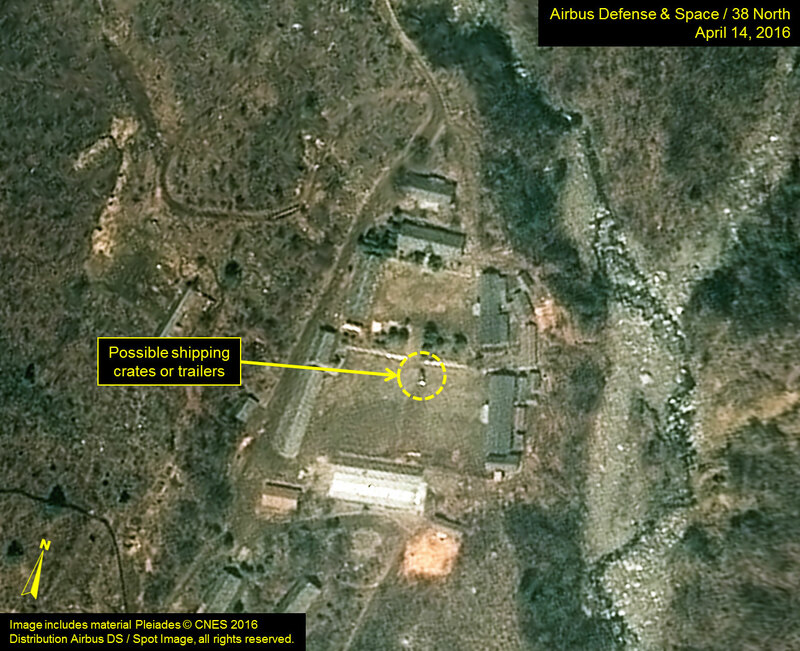 At the Main Support Area, where equipment and personnel are marshaled in preparation for tests and the site of low-level activity throughout 2016, imagery shows the presence of what is likely a shipping container or equipment trailer—or possibly two positioned close together—in the main courtyard. Overall, this object measures approximately 1.25 meters by 4.75 m meters. The area in and around the Main Support Area is clear of snow and well maintained, which also indicates that it is active. Figure 2. Large object seen at the Main Support Area. As for the other two operational areas where a test might be conducted—the West and South Portal—there is no apparent activity at either site in the April 14 image. However, it is noteworthy that the areas around the portals are clear of snow and well maintained, indicating that they are active.